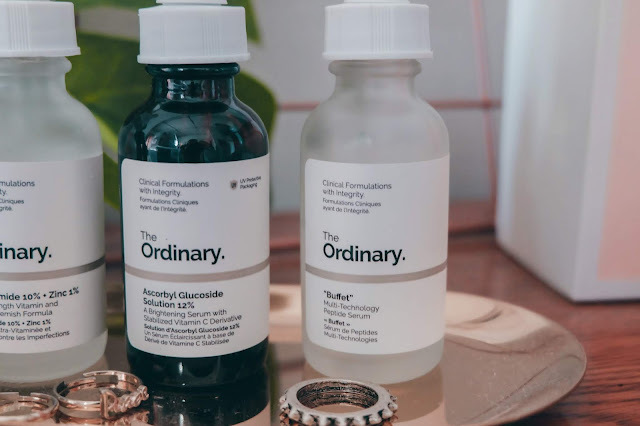 THE ORDINARY REVIEW – NIACINAMIDE 10% + ZINC 1%, ASCORBYL GLUCOSIDE SOLUTION 12%, & THE BUFFET - Eunice C.
I am finally writing my review on The Ordinary after using their products for almost 3 months! The Ordinary, a brand from the parent company, Deciem, is known for their affordable line of serums and moisturisers containing sophisticated active ingredients, and packaged into cute, minimalist dropper bottles. Deciem is dubbed as The Abnormal Beauty Company introduced The Ordinary as a brand that provides an “an evolving collection of treatments offering familiar, effective clinical technologies positioned to raise pricing and communication integrity in skincare”. This means they allow consumers to have an opportunity to purchase their products, which are formulated with clinically proven ingredients at an affordable price! Hence, the tagline “Clinical Formulations with Integrity”. With that being said, all DECIEM products, across all brands including The Ordinary, are free of parabens, sulphates, mineral oil, methylchloroisothiazolinone, methylisothiazolinone, animal oils, coal tar dyes, formaldehyde, mercury, oxybenzone. Also, they are against animal testing. 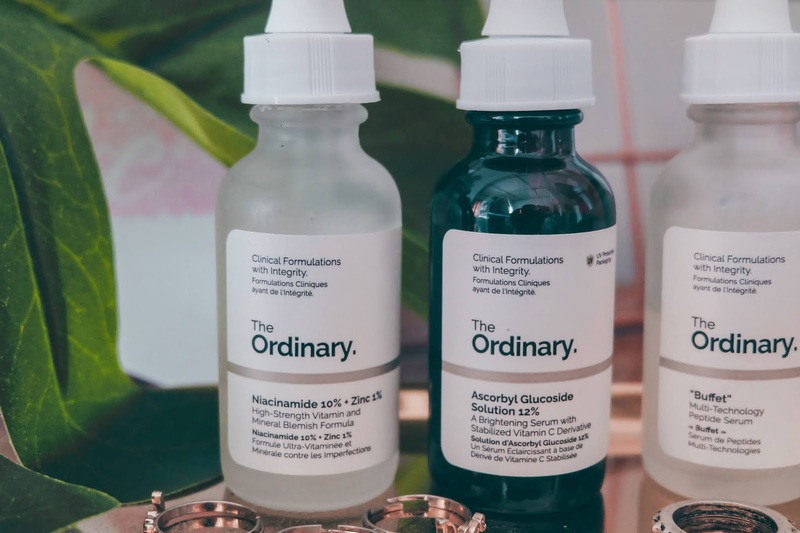 I am very interested in the wide array of potent skincare ingredients formulated in The Ordinary. 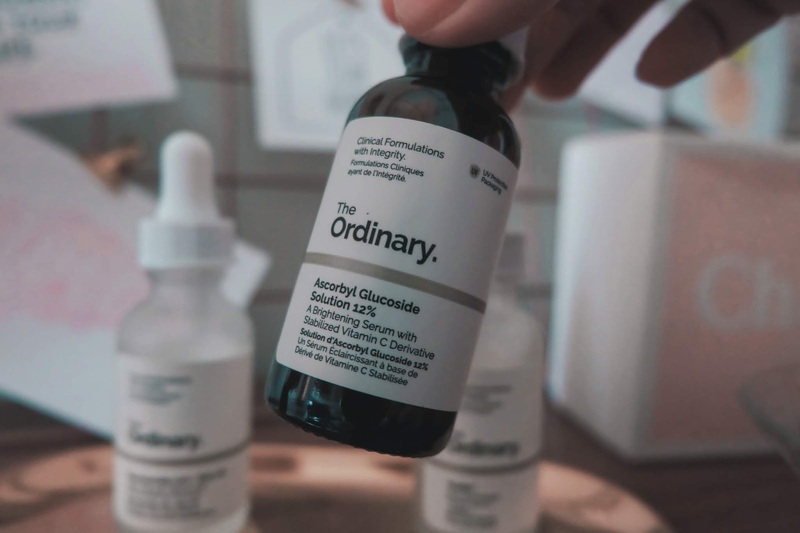 The Ordinary takes pride in honesty and integrity in their formulations. This probably explains their transparency about their active ingredients without the addition of any dodgy stuffs consumers should be wary about. In fact, they name their products based on the name of the active ingredients! 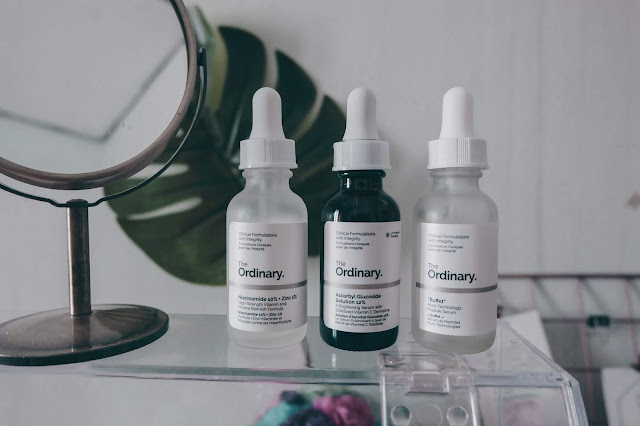 The Ordinary is categorized into Retinoids, Vitamin C, Direct Acids, Antioxidants, Hydrators & Oils, Molecules, and Suncare. The different types of formulation targeting different skin problems. You may refer to the regime guide from The Ordinary website! Niacinamide is a popular ingredient in skincare products that we always hear beauty junkies rave about. Niacinamide is actually vitamin B3, a water soluble vitamin, which functions to reduce visibility of enlarged pores and uneven skin tone, and improve skin radiance. In addition, niacinamide is able to boost hydrating ability of moisturisers, thus reducing moisture loss when apply topically. The addition of zinc balances sebum activity and aids in healing of damaged skin. How I use? 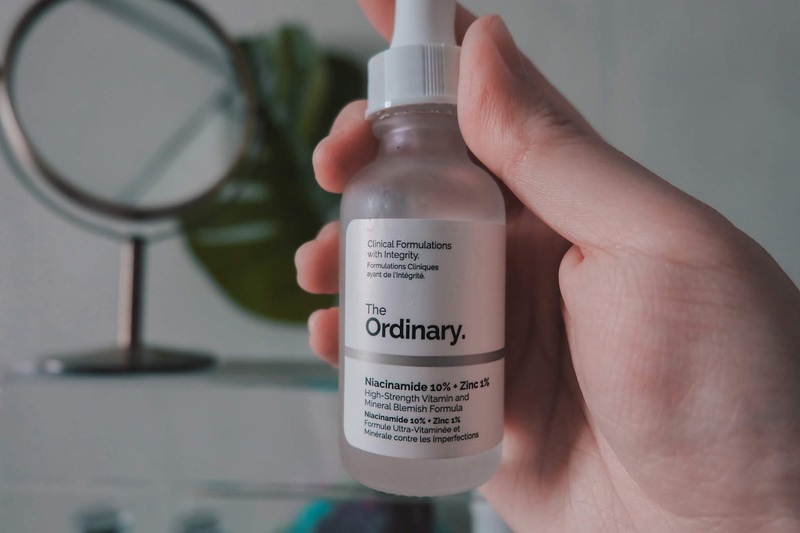 According to The Ordinary website, it is stated that Niacinamide is contraindicated with Vitamin C. They suggest to apply Niacinamide at alternate time (ideally Vitamin C in the PM and Niacinamide in the AM). The combination of the two ingredients will lead to -1)it neutralizes the effectiveness of both ingredients, and 2) it might create a substance (nicotinic acid) that leads to skin redness. I did further research about this and discovered that the claim is in fact, a myth. Apparently, the research about the incompatibility was 40 years ago, making the studies obsolete. Newer researches were conducted and better formulations were produced in the recent years and it was came to known that the combination of vitamin C and niacinamide produces synergistic effect. My Thoughts & Experience? 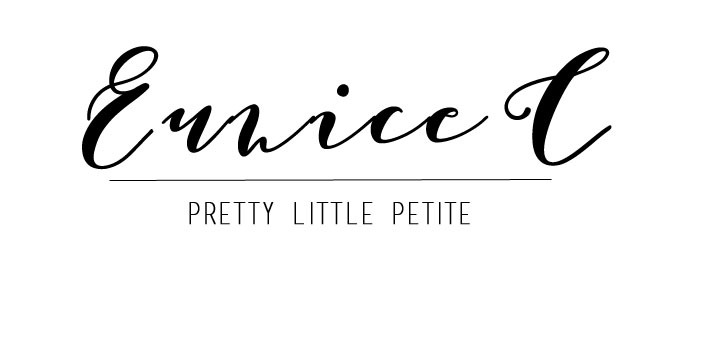 My experience with Niacinamide 10% & Zinc 1% was not as promising as expected. Nevertheless, it delivered relatively vast positive results compared to the other two products that I tried. I used Niacinamide first before adding vitamin C into my skincare routine after 2 months. And I saw improvement on the areas with uneven skintone caused my acne scars. I read that Niacinamide does lighten scars and corrects hyperpigmentation. However, I did not experience significant improvement of my skin hydration status throughout the day. Perhaps its function as a hydration booster did not work on my skin. What does it do? As everyone knows, Vitamin C is a powerful antioxidant that brightens skin, prevents free radicals from damaging skin, and hence reduces signs of aging. Vitamin C is unstable in water if it’s in pure form. 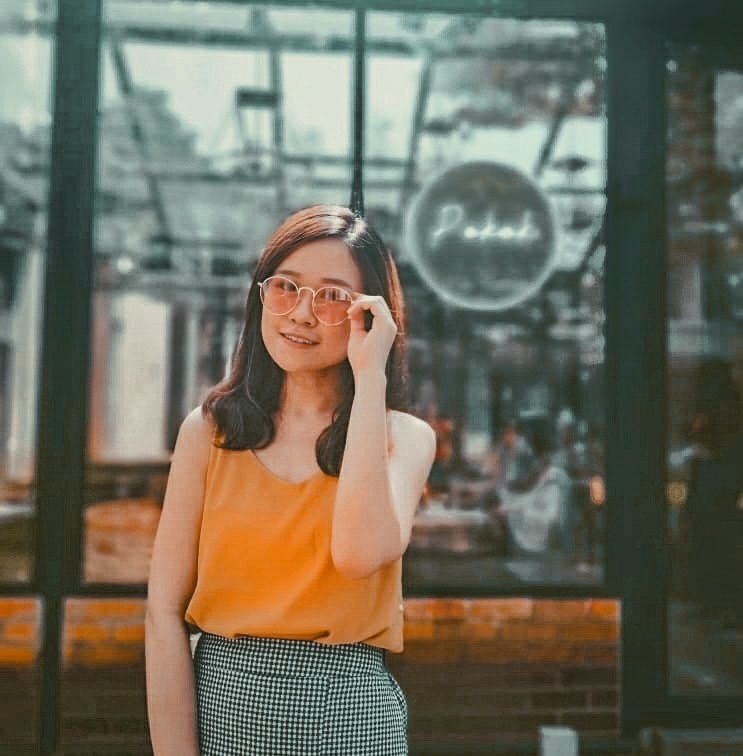 Ascorbyl Glucoside is a water-soluble derivative of Vitamin C. It is much more stable in water but it is less potent than direct L-Ascorbic Acid. It is the gold standard in terms of stability and comfort use. This water based serum has lighter formulations and very easy to incorporate into skincare routine. Plus, water soluble vitamin C serums are more effective compared to oil based. Ingredients? Aqua (Water), Ascorbyl Glucoside, Propanediol, Aminomethyl Propanol, Triethanolamine, Isoceteth-20, Xanthan gum, Dimethyl Isosorbide, Ethoxydiglycol, Trisodium Ethylenediamine Disuccinate, 1,2-Hexanediol, Caprylyl Glycol. How I use? As spot treatment before moisturizer. You may refer to the How I Use? Section in Niacinamide. If your skin is a little sensitive, you may alternate it with Niacinamide. Otherwise, it is not a problem to use it together. My Thoughts & Experiences? This serum totally breaks my perspective of vitamin C serum being harsh and irritating to skin. This vitamin C serum is mild and gentle to my skin. I did not experience any breakouts after adding it to my skincare routine. It has a more rapid absorption compared to the Niacinamide serum. The scent was light and has a faint citrus scent. Packaged in an amber glass dropper bottle, it protects vitamin C serum from oxidation. I have yet to see any promising results in terms of its anti-aging properties, but my skin definitely has a more even and radiant appearance. What does it do? The Buffet combines a comprehensive array of studied technologies to target multiple signs of aging at once. The technologies are Matrixyl™ 3000 peptide complex (with palmitoyl tetrapeptide-7), Matrixyl™ synthe'6™ peptide complex (with palmitoyl tripeptide-38), SYN™-AKE peptide complex (with dipeptide diaminobutyroyl benzylamide diacetate) etc.. I know it’s quite a mouthful to say but there are all peptide complexes. The Buffet also contains antioxidants, hyaluronic, and amino acid complexes. Peptides and amino acids are essential for the formation of protein which is important in giving your skin support and structure. Ingredients? Aqua (Water), Glycerin, Lactococcus Ferment Lysate, Acetyl Hexapeptide-8, Pentapeptide-18, Palmitoyl Tripeptide-1, Palmitoyl Tetrapeptide-7, Palmitoyl Tripeptide-38, Dipeptide Diaminobutyroyl Benzylamide Diacetate, Acetylarginyltryptophyl Diphenylglycine, Sodium Hyaluronate Crosspolymer, Sodium Hyaluronate, Allantoin, Glycine, Alanine, Serine, Valine, Isoleucine, Proline, Threonine, Histidine, Phenylalanine, Arginine, Aspartic Acid, Trehalose, Fructose, Glucose, Maltose, Urea, Sodium PCA, PCA, Sodium Lactate, Citric Acid, Hydroxypropyl Cyclodextrin, Sodium Chloride, Sodium Hydroxide, Butylene Glycol, Pentylene Glycol, Acacia Senegal Gum, Xanthan Gum, Carbomer, Polysorbate 20, PPG-26-Buteth-26, PEG-40 Hydrogenated Castor Oil, Trisodium Ethylenediamine Disuccinate, Ethoxydiglycol, Sodium Benzoate, Caprylyl Glycol, Ethylhexylglycerin, Phenoxyethanol, Chlorphenesin. That is a very long list of ingredients in a small bottle of serum. Totally lives up to its name as The Buffet. How I use? Apply to the entire face in the AM and PM after cleaning. 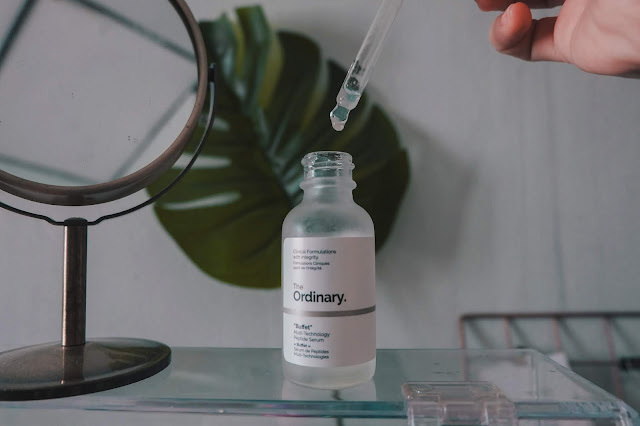 The Ordinary website recommends to alternate use between peptides, Vitamin C (L-Ascorbic Acid and Ethylated Ascorbic Acid) and Direct Acids for maximum benefits due to the susceptibility to degradation. My Thoughts & Experiences? To my disappointment, I fail to see any significant results on my skin integrity and elasticity. This product was one of the best products from The Ordinary and is highly raved by my favourite beauty Youtuber, Liah Yoo. It is a very budget friendly anti-aging skincare product. 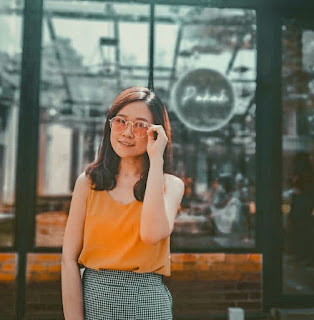 This is perfect for someone who’s in their late or mid-twenties who are looking to start on an anti-aging product but do not want to invest in a high end product yet. 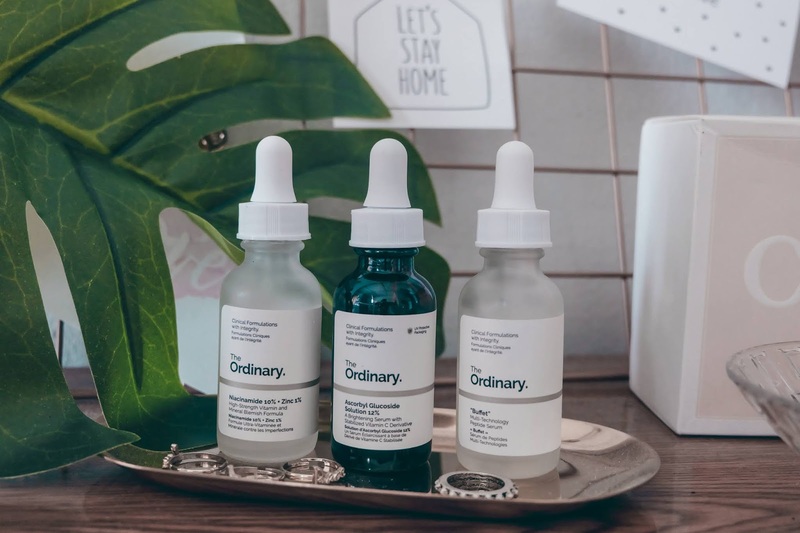 In fact, Deciem actually suggests their other brand Hylamide, for more potent anti-aging effects, as it offers a next-generation formula, SubQ Anti-Age. Overall, I personally did not experience ground breaking results. I started to see very subtle improvements only after using them for months. With an affordable price you pay for a reasonable amount of 30ml serum, I could not ask for more. Will I repurchase? Maybe only for the Niacinamide.